Fighter chokes referee after getting knocked out. Opponent celebrates 12-second knockout victory. Special thanks to Brett Weiss owner of GorillaSnowGear.com for capturing the video and the folks at KOP for allowing us to share it! It happened at the MMA event KnockOut Promotions KOP 54. Fighters Ryse Brink and Joseph Nehm squared off inside the cage at the Deltaplex in Grand Rapids, MI. The fight started off as most fights do, but the finish and what happened after is nothing short of amazing. In most combat sports, especially boxing and MMA, fighters are told to “protect themselves at all times”. Rarely does this apply to the referee. Tonight this referee was forced to put in some overtime as the fight continued after the knockout. 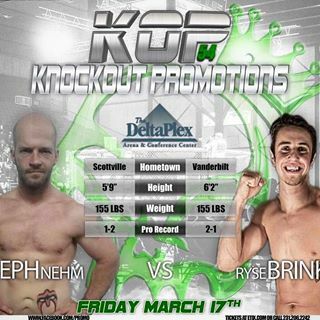 After a stunning knockout by Ryse Brink (who fights out of Stars and Strikes MMA in Westland, MI), his opponent was disoriented and unaware that the fight was over. The referee stops the fight in plenty of time to prevent any unnecessary injury to the losing fighter. Good job, Ref! But Nehm was so disoriented from the knockout that he thought the referee was his opponent and that the fight was still on. In the video below, you can see Nehm’s team rushing to pull him off the referee. Language by the person recording the video is NOT SAFE FOR WORK.